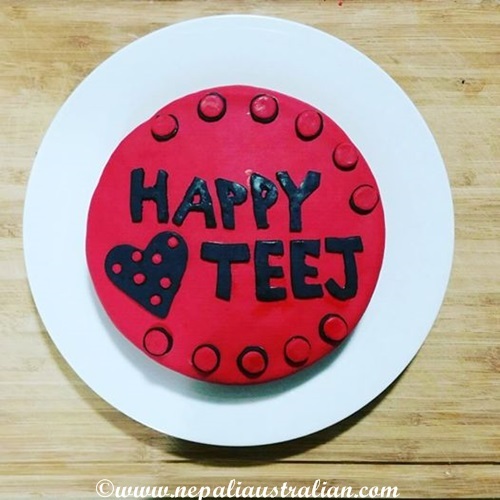 Yesterday was Teej, a day when woman fast for the whole day for marital bliss, well-being of their spouse and children and purification of their own body and soul. Married women fast for their husband’s long life, prosperity and long and strong relationship between them until death in this life and all the lives to come, while the unmarried pray for the perfect husband. Unless someone is ill or physically unfit, fasting is followed by women and girls who have reached puberty. Please click here if you want to know more about the festival. Like every year, we celebrated Teej with lots of food and dancing but this year Teej was extra special for me because my mum is here with us. Chhori has started enjoying and understanding celebrations too. She loves to be around people and wants to dance when the music is on. I am hoping she will be interested in Nepali culture and traditions in future when she has an understanding of their importance. 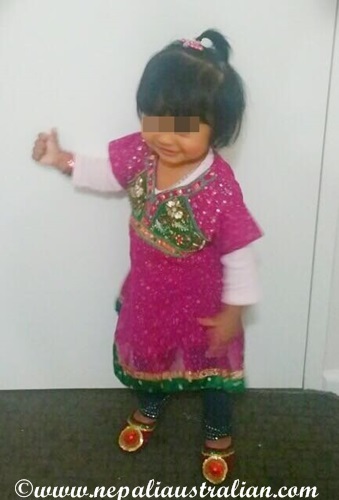 For the first time, I dressed Chhori in Kurta and Nepali chapal (Nepali velvet sandles) with chura (metal bangles). I know I am biased but I think she looked so cute in the traditional outfit. And look our matching chapals, loved them. I also dressed up in the traditional red outfit. The first celebration, we had was at my friend’s house. I baked a cake for the occasion and everyone contributed toward the food. We had a great time eating, dancing, laughing and having fun. Chhori also enjoyed in her own way :). 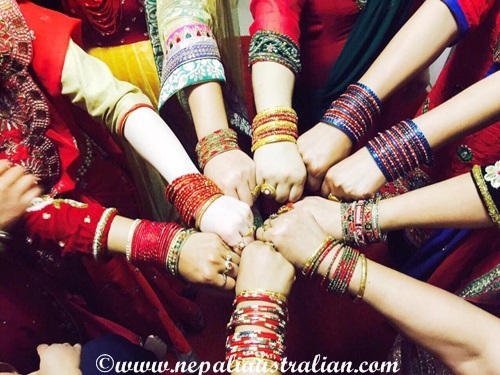 Then on Saturday, we went to a Teej celebration program organised by Nepali committees. We dressed up again and enjoyed the celebration with hundreds of other ladies dancing and enjoying the yummy food. Wishing Happy Teej to all of you out there celebrating . Have a great time and enjoy your day. 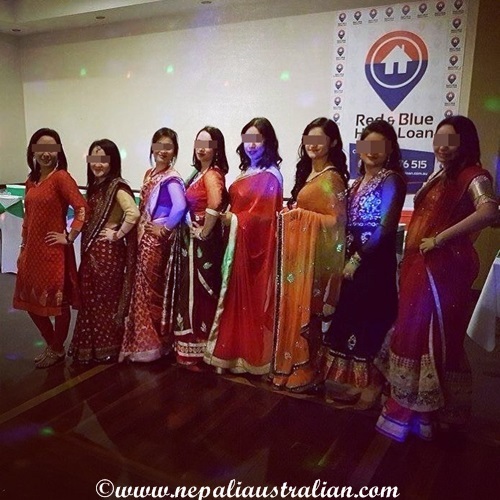 This entry was posted in Celebrations, Kathmandu, Nepal, Nepali Culture and tagged 'Rishi Panchami, Antakshari, Australia, australian, australian nepali, Bhadra Sukala Paksha, Chaturthati, Dar Khane Din, fasting day, grand feast, Happy Teej, hindu women, holy basil, life prosperity, Lord shiva, M from nepaliaustralian, marital bliss, Nepal, Nepalese, Nepali, nepali australian, Nepali blog, Nepaliaustralian, nepaliaustralian blog, Pashupatinath temple, purification day, Teej, Tulsi patta, women in Nepal. Bookmark the permalink. Very colorful, bright and cheerful! Looks like so much fun 🙂 I was in Lumbini for Wesak Day. 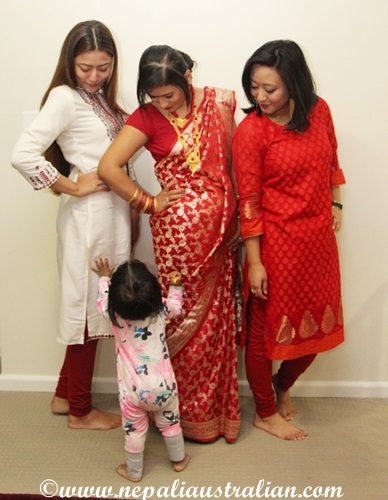 There were many Newari, Gurung and Tamang women dressed in their beautiful costumes. Thank you so much. Lumbini is one of the greatest places to visit in Nepal. 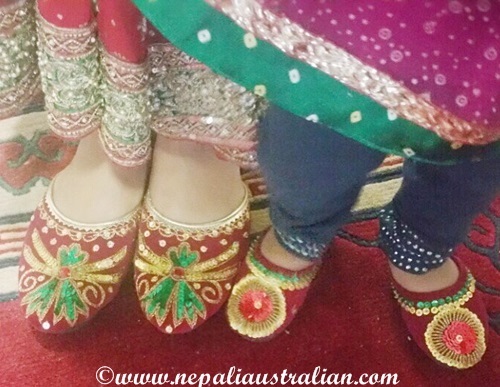 Hey… didn’t know that teej is celebrated with such great enthusiasm in Nepal too… loved the pics… you and chhori are looking great in traditional dresses… 😃😃 stay blessed..